Latinos helped fuel Charlotte's recent economic boom. But state policies are not always welcoming. CHARLOTTE, N.C.—The Bank of America corporate center and the Duke energy center are the jewels of Charlotte’s skyline. These buildings and many others only went up in the last 25 or so years, when the city started its celebrated transformation. It’s now the second-largest banking center in the U.S., and recovering steadily after the recession. Between 2010 and 2013, the population growth here was second only to Austin, and in the next decade or so Charlotte might become the fastest-growing U.S. city, according to U.N. projections. The patches of new development between the tall buildings downtown confirm this ongoing boom. 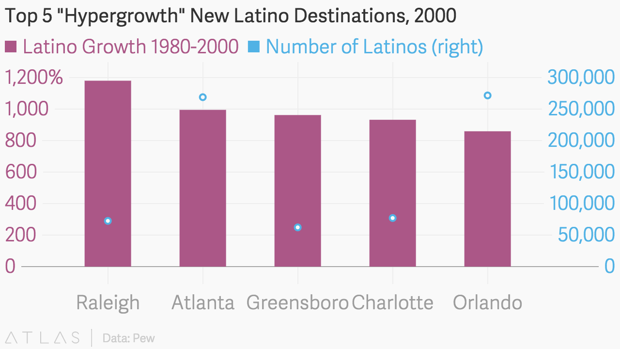 Charlotte’s upward economic trajectory since the 1980s has been accompanied, and bolstered, by the mind-boggling growth of its Latino population. A negligible 0.098 percent of the city’s residents were Hispanic back in 1980; that figure was 13.1 percent by 2014. For about three decades, Latino labor has helped build and run the city, Latino entrepreneurs fueled its economy, Latino families have enriched its urban and suburban neighborhoods, and Latino kids have populated the city’s public schools. The city has noticed the importance of this population and tried to be more welcoming over the past few years. Although a majority of Charlotteans feel their city is welcoming, Hispanic residents are more likely to disagree. One of the biggest obstacles in the city’s efforts to make itself more immigrant-friendly is the North Carolina state legislature, both houses of which were taken over by Republicans in 2010 for the first time since 1870. As city officials and urban scholars are fond of saying, Charlotte is “a blue spot in a deep red state.” And that makes it hard for the city to implement many policies that could help the thousands of Latinos who call Charlotte home. Between 1980 and 2000, Charlotte’s Hispanic population grew a staggering 932 percent—more than twice the national rate. The city is one of the 18 metro regions around the country that experienced Latino “hypergrowth,” defined as an increase of more than 300 percent in that time period. Of the Hispanic hypergrowth metros, three of the top four were in North Carolina. Some Latinos came to North Carolina as migrant labor during the 1980s to do seasonal agricultural jobs, picking tobacco and working on Christmas tree farms. When those jobs dried up, many stayed to work in large hog and turkey processing plants located in several smaller towns, many of which were losing population at the time. The Latino families who settled in these places are still keeping them afloat, says Owen Furuseth, geography professor at University of North Carolina-Charlotte. "Quite frankly, but for the Latino residents, these place would dry up and blow away,” Furuseth told a group of journalists in Charlotte as a part of a reporting trip organized by the Aspen Institute Latino and Society. “The Latinos have become the entrepreneurs. They are the labor force." Eleven of these metros lie in the Southeast, with three North Carolina cities—Charlotte, Greensboro and Raleigh—epitomizing the “new economy” of the 1990s with rapid development in the finance, business services, and high-tech sectors. Furuseth calls the above set of factors the “Bank of America phenomenon” in Charlotte. When the big bank decided to move its headquarters to the city, it hired a Houston-based construction company to build their corporate center. When the company realized Charlotte didn’t have a large blue-collar workforce—construction workers, electricians, plumbers, and so on—it recruited from along the Rio Grande border. Word spread among Latino workers, with and without documents, looking for job opportunities. The workers who built the city put down roots in Charlotte because the city offered them a better quality of life than traditional hubs like New York and L.A. (Brookings has called the city a “major immigrant gateway.”) Instead of being squeezed into high-poverty inner-city neighborhoods, Latino immigrants in Charlotte spread out in mixed-income middle-ring suburbs, where affordable housing was accessible. As the banking sector flourished, higher paying jobs and opportunities for entrepreneurship were created, including for female members of the new families. A big bonus for these workers back then: immigration was a “non-issue,” politically, says Furuseth. She’s accompanied by Ron Carlee, the city manager, and by Stefan Latorre, the chair of Charlotte’s Immigration Integration Task Force, which was set up in 2013 to make the city more hospitable for its rapidly growing immigrant population. “While there are a lot of social and economic justice cases to be made with regard to embracing a multicultural society, there’s a really strong business case to be made,” Carlee says. After gathering information from community leaders, academics, and activists, the task force released a report with recommendations in March 2015. These include encouraging immigrant-owned businesses; ensuring immigrants have access to fair, safe housing, and better infrastructure in their neighborhoods; building trust between immigrant communities and law enforcement; and spreading awareness about naturalization and citizenship. They’d also like to introduce a community ID that all residents can use, including undocumented ones. But while the city is trying to take these pro-immigrant steps, the conservative state legislature has been moving in an anti-immigrant direction. The issue of IDs has been one of the most controversial. In North Carolina, as in most other states, undocumented workers are not eligible for driver’s licenses. Immigrants who arrived in the U.S. illegally as kids and are eligible for the government’s Deferred Action for Childhood Arrivals (DACA) extension can live and work in the country, however, and are eligible to apply for a state license. In 2013, North Carolina became the only state to issue them a special driver’s license stamped with the words “No lawful status.” Immigration activists and civil rights groups have argued that labeling state IDs with that statement is a violation of privacy of these immigrants, and can lead to discrimination when they apply for jobs, loans, or encounter the police. Earlier this year, the state House also passed a bill that proposed jail time for those caught driving without a driver’s license. Proponents of the law hoped it would get undocumented folks off the road. Also in 2013, the state passed the ”Reclaim NC Act,” or H.B. 786, which would have allowed residents to get drivers licenses regardless of immigration status but used the records to enforce immigration law more strictly against undocumented drivers. It was ultimately vetoed, but activists likened it to Arizona’s notorious “show me your papers” law. This June, the Charlotte city council passed a civil rights resolution that asked its police not to profile immigrants and enforce immigration law during instances such as routine stops. But the state legislature hit back with S.B. 318, which Governor Pat McCrory signed into law in October. That rule makes it illegal for municipalities to make sanctuary city-type laws, and therefore nullifies the civil rights resolution Charlotte just passed. It also says that municipal IDs—like the ones Charlotte has been trying to get for undocumented residents—will not be recognized by law enforcement and other government agencies. “You get retaliation when you try to do the right thing,” says Carlee, the city manager, speaking of this series of events. These state laws push immigrants, especially undocumented ones, into the shadows. They’re afraid to drive to work, because they’re so afraid of being deported. (Deportations in North Carolina have been increasing every year.) But if they don’t, they can lose the jobs they are working to support their families. The state is hindering the advance of Charlotte’s Latinos at the neighborhood level as well as the personal level. As the city develops, Latinos, African Americans, and other low-income groups are at risk of getting displaced from certain areas. 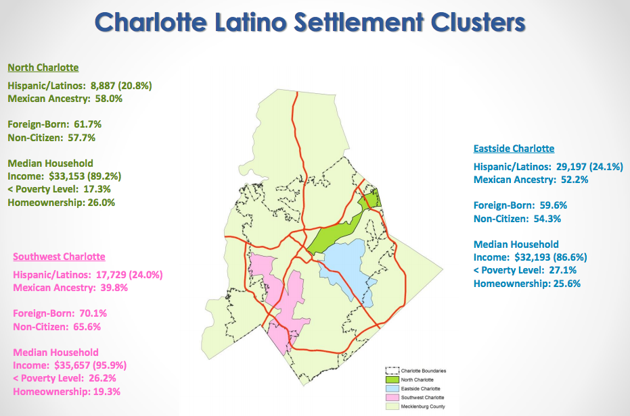 Today, the diverse Hispanic population is scattered around the Charlotte-Mecklenburg county area. While many of them are business-owners and entrepreneurs, many are working poor concentrated in the high-poverty neighborhoods in North Charlotte (shown in the map below). There are real problems associated with living in high-poverty areas. Harvard economist Raj Chetty’s recent social mobility research pegs Mecklenburg County as the second worst in which to grow up poor. Charlotte’s schools are also re-segregating. But the big tools cities can use to allow opportunities for economic and residential mobility, like raising the minimum wage or instituting inclusionary zoning policies, are forbidden under North Carolina state law. The city, meanwhile, is trying to improve the neighborhoods where low-income Latinos live. Charlotte tried (albeit in vain) to lure developers with incentives to construct affordable housing. And City Manager Carlee says they’re trying to make the city more walkable. They’re putting in bike lanes and improving the bus, light rail, and streetcar connectivity so immigrants don’t have to shoulder the costs of car-ownership and can benefit from transit-related neighborhood investment. “From a city standpoint, what we have to do is make sure that opportunity comes to all parts of the city, and you do that through land use and investments—particularly transportation investments,” says Carlee. Oliver Merino came to the U.S. in 1999, when he was 10 years old. Merino’s mother took him, his older brother (13 at the time), and his younger brother (just one) and trekked from Mexico through the desert into Arizona over five days and four nights. His father was already in America; he’d found a job at a poultry processing factory in Monroe, North Carolina. His parents came to America illegally because they’d lost their jobs when the Mexican textile factory they worked at outsourced operations abroad. They would have tried to come legally, Merino says, but that takes time and money—and his family had neither. Merino grew up in Monroe. He saw his first snow there, graduated from high school, and was one of the few lucky undocumented kids to get a scholarship to college. He now works for the Levine Museum of the New South in Charlotte. Merino considers himself a Southerner and a Charlottean. Merino is a recipient of the DACA extension, which means he’s exempt from deportation and can temporarily live and work in the country. He’s also a young immigrants’ rights activist fighting anti-immigration policies in Charlotte. He’s seen the city-state politics play out, and thinks that Charlotte is now at a crossroads. The new mayor has a history of engaging with the Latino population, he thinks, and should be able to do more than use “the state legislature as an excuse to remain silent.” He also feels that the national and statewide anti-immigrant rhetoric has woken people up. He hopes it improves Hispanic voter turnout in the elections to come.